What is the priority when draught-proofing the home? When draught-proofing and insulating we tend to focus on all the sources of cold draughts entering the home. This can sometimes result in homeowners blocking vents that are vital for adequate ventilation of installations that need a supply of fresh air, such as gas fires, solid fuel fires, and heating and cooking appliances. Having a supply of fresh air is essential for a healthy living environment for the occupants as well. Trickle vents on windows should be left open to maintain a constant supply of fresh air. Instead of focussing on where cold air gets in, we should concentrate our attention on where the warm air gets out. You may think this are the same sources but airflow in a building is complicated, and often there are points at which warm air escapes, causing a current of air that pulls cold air in from other places. We tend to feel the cold air coming in more than the warm air escaping, which is why we block the ways in for cold air. How does warm air escape? The single biggest source of heat loss in the home is an open chimney. It’s like leaving a window open all the time, except that the passage of warm air out is exacerbated by a phenomenon known as the stack effect. Chimneys are designed to draw air out of a building and continue to do this whether the fire is lit or not. If it is cold outside, and warm inside, and it’s a tall chimney, then this effect is increased dramatically. The Buildings Research Establishment (BRE) state that an average of 80 cubic metres of air travel up a chimney per hour. 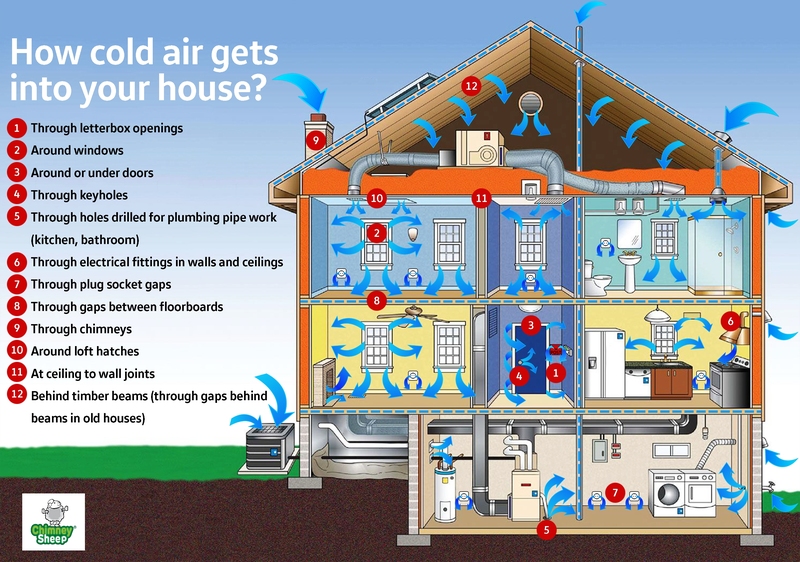 This volume of air needs to be replaced, so cold air is pulled in from other leaky parts of the building, such as round doors and windows, or through vents that need to be left open. Block the chimney, and these cold draughts are significantly and immediately reduced. The Chimney Sheep is an effective chimney blocker made of felted sheep wool. It’s easy to insert and remove, lodging in the throat of the fireplace. It is not recommended for gas fires however, since there could be issues with carbon monoxide poisoning if the fire is accidentally lit with the Chimney Sheep in place. The Chimney Balloon is an inflatable device for blocking the chimney. The original Chimney Balloon, made in the UK, is made of tri-laminate plastic that simply shrivels and falls into the grate if a fire is accidentally lit with it in place. Don’t be tempted to buy a cheaper PVC one. These are less flexible in terms of the range of flues they can fit into, are more resistant to heat so will stay in place longer if a fire is lit, and will eventually pop releasing chlorine gas and PCB’s. Even without an open chimney, buildings can cause a stack effect, by warm air being drawn to the top of the building and cold air pulled in from at the ground floor. If you haven’t got a chimney then the next thing to check is the loft hatch. Most lofts are well insulated these days but if you just have a thin board covering the loft hatch then warmth will escape through this, and around the edges. Seal the edge of the board with draught excluder and the back of the board with a thick layer of insulation. If you have a standard loft hatch then it’s possible to purchase a ready-insulated loft hatch cover. Another source of heat loss into the loft is around down lights. It is difficult lay insulation over these as it can cause a fire hazard. Protect the back of the downlights with loft lids, and then a thick layer of insulation can safely be placed over these.